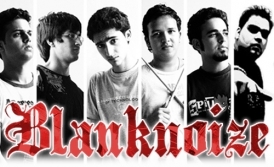 Blank Noize was built by unknown forces in April 2006 when 5 cool people who went to the same school met each other and shared a similar interest in life. Even after they all passed out from school, they stayed together, and continue to do what they do best. This noize can be dated back to their very first gig (April 2006), the highly anticipated show at home turf (Modern School BK) with the famous pakistani rock band ’JAL’. "It was a make it or break it situation, as first gigs always tend to be a bit messy" says Kashif Iqbal (Vocalist). Over 5000 people witnessed the show, and the band ’JAL’ themselves congratulated Blank Noize for a scintillating performance. "It was our first gig, and over 5000 people turned up, it lifted our confidence, but at the same time, our hearts were in our mouth" says Vidit Garg (Drummer). The band is linked to many genres, and various playing styles. Primarily, the band plays alternative rock/fusion. "We play almost everything. We initially covered bands, and later switched onto creating original music. We listen to a lot of stuff, and I think that just contributes to what we create." says Kartike Jain (Guitarist). "We felt the lack of bands that are bilingual, therefore our songs are both in english and hindi" adds Kashif, who also writes lyrics for the band. The band has been a regular part of the live circuit, has played live on air on radio channels 98.3 fm and 102.6 fm, and has been featured on NDTV, as well as covered by various newspapers across different cities, and has been regularily been playing in college fests and social gatherings. Watch out for the noize.